The Goodison Park Stadium Tour offer fans and visitors to Liverpool the chance to experience what goes on behind the scenes at this famous football club. The guided tour include a visit to the trophy room, home and away dressing rooms, dug-outs, and a walk down the players’ tunnel. Tours last approximately 1¼ hours and are offered every Monday, Wednesday, Friday and Sunday at 11 am and 1 pm. Tours are not held on match days or in the afternoon before a home fixture. Tickets currently cost £8.50 for adults and £5 for children under 16. Family tickets (2 adults and 2 children) cost £20. Advance bookings are strongly recommended and can be made by calling 0151 530 5212 between 8 am and 6 pm, Monday to Friday. Goodison Park is situated in the Walton area of Liverpool. 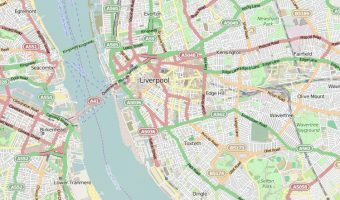 For visitors using satellite navigation, the postcode to enter for Everton FC is L4 4EL. The nearest train station is Kirkdale (Merseyrail), approximately ¾ mile from the stadium. Buses to Goodison Park depart from Queen Square Bus Station and the Liverpool One Bus Station (19, 19A). Map showing location of Everton FC: Goodison Park Stadium Tour. Dave Hickson was superb, what a legend!! All the staff concerned were great and the tour was excellent. What a feeling-running up the tunnel to the tune of Z-Cars!! We’ve got to move forward if we want the success we had in 80s. We need a better ground with better facilities to attract more support.